I’m looking forward to seeing all of the birds return. There are so few coming to the feeders, it’s been so cold. Winter is so not my favorite time of the year. Scraping ice off the car, shoveling snow off the walk, nope, not into it. So, I’m looking for an early spring this year, with open arms. This is a great time for staying in and working on the drawing board though. But I’m not getting quite as much art produced as I did last year at this time. I’ve started an eCommerce business. Decided to branch out into some other things that I love to do. I’m a big fan of soymilk, so I built a website where I can sell the soymilk machine that I use and love. This is why the posting has been thin these days. Still working on the concept of balancing my time between my two worlds. It’s a priority thing. 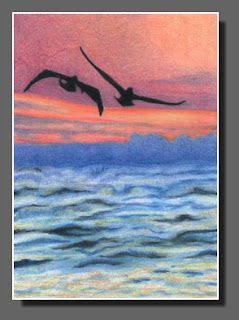 The art piece for today is another one of my ATC (artist trading cards) in the Silhouette Sky series, done in Colored Pencil. Have a grand day! Dee, beautiful work. Thanks for the inspiration! Spring can’t come too soon here in the Cleveland area either! Dee, thanks for your encouragement. Love your work! Also waiting for the snows to leave… (sigh). Great ATC! I love the colors, wish I could be somewhere like that now 🙂 I’m with you on this winter stuff – ready for it to end! Thanks Mark and Ann!! Don’t know what happened Mark, looks like you were having trouble getting your comments to post, then everything posted. We just had another snow dump on us here. But it’s calling for some warmer weather this week.